I don’t know about you guys, but I’m so ready for Christmas. After having to by-pass the two other major Fall holidays this year, all I want is to unpack my 200+ nutcrackers and put up a dang tree. Christmas shopping is already underway (it still counts if it’s for me and I say it’s ‘for christmas’) and I already broke out my Christmas DVDs. Now all I need is a drink. 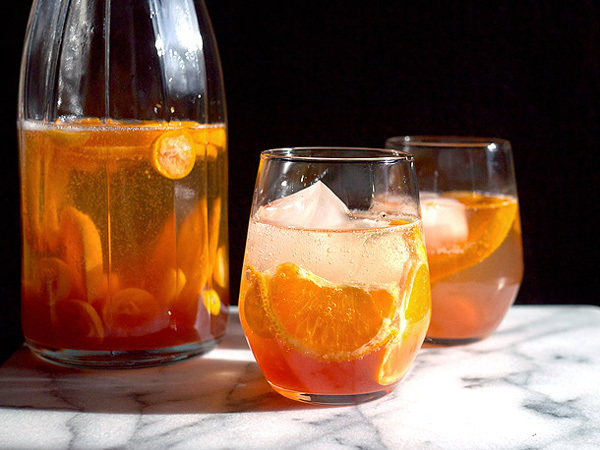 It’s funny how with the invention of Pinterest that I realize that many other like-minded people are also dreaming of winter cocktails, and even further into that niche, they are thinking about winter sangria. Yep, I totally want to throw cranberries into all kinds of things lately, including this drink, but not quite the way you’d think to include them. If you’ve looked at my previous sangria recipes this year (which you can find here and here) you might notice that they tend to become quite layered. The reason is, if it’s not, I find it boring. A few weeks ago I was invited to be part of the “media” who judged a sangria contest sponsored by Pavan liqueur. I won’t point out who, but some of the drinks I found to be just one-note beverages. They were flat; they were boring. That’s so sad. When I did like the drink, it was because the bartender had put a lot of thought into the layers that were making up the recipe. Flavor after flavor that both was interesting, worked as a whole, and was not boring. And that’s what I want when I am drinking sangria and when others might possibly be ingesting the drink too. 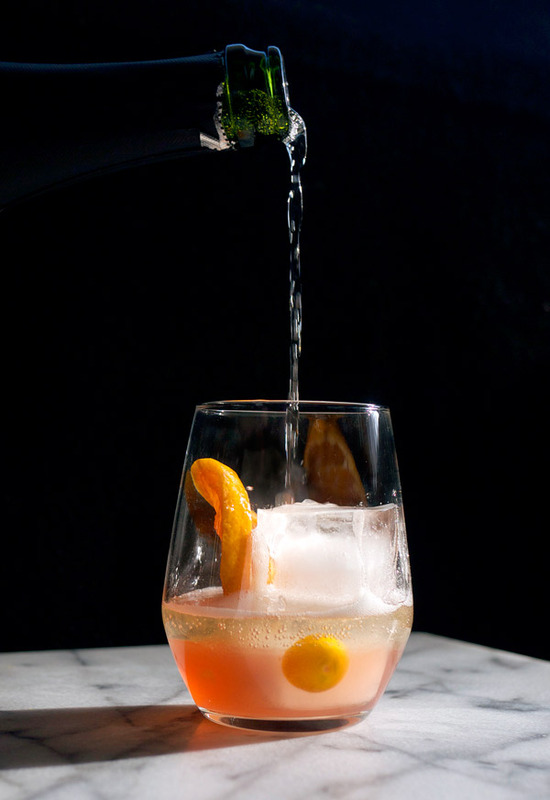 Fast forward to last week where I put the finishing touches on this sangria recipe I had been dreaming about and up it went on the Serious Drinks site. I will be posting some recipes this month on their site, so please jump on over there from time to time and check them out. Outtakes and the usual nonsense will be found here still. For the syrup, combine water, sugar, cranberries and peppercorns in a medium-sized sauce pan over medium-high heat. Bring to a boil and remove from heat. Cover and let stand for 30 minutes. Cool and fine-strain mixture through cheesecloth or a coffee filter into an air-tight container. Will keep refrigerated for one week, or add half an ounce of vodka to the mixture to prolong freshness up to 3 months. For the base, combine sliced kumquats and tangerines in the base of an airtight container with ginger shrub, syrup and pavan. Refrigerate for at least two days and up to four days. For individual servings, pour 1 and a half ounces of base into the bottom of a white wine or rocks glass along with any desired fruit from the base. Add ice cubes and top with 4 ounces of the Cava. Gently stir to combine and serve. For a full pitcher, add the entire bottle of Cava to a pitcher containing the base. Stir gently to combine, and pour into individual serving glasses. Lots of flavor with sharp, spiciness from the ginger and pepper. 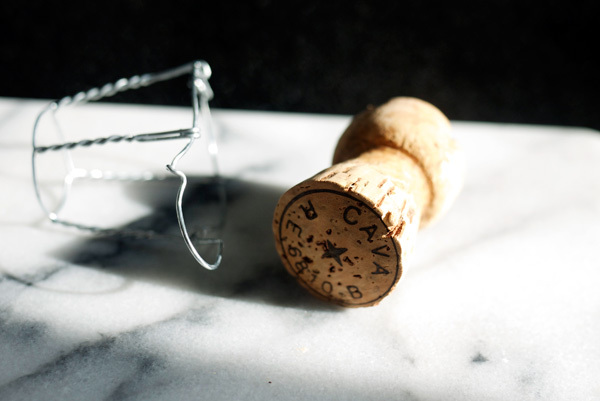 The dry cava balances out the sweet, syrupy base. Gentlemen, this is a sangria drink for you too; it bites back. I served this drink at a private party this weekend and one guy had 6 servings. Granted, the alcohol content is not too high, but seriously: SIX. He dragged people over to try it and they were also converted. I’m convinced all of your guests will love this. This is so up my alley. I’ve been infusing all sorts of stuff with cranberries and am adding this to my list. I’m really into the black pepper here! You’re right–sangria is often way too basic. Gorgeous shots too, girl! Hey this sounds great. Thinking of making it for Christmas, but Pavan and the Ginger Shrub are not available to me. Wondering – is St. Germain a suitable replacement for the Pavan? OK, let’s talk substitutions! Any substitution of ingredients will change the flavors slightly (or drastically) but that doesn’t mean it’s not going to taste awesome still. For the Pavan, the floral aroma is orange blossoms, which are quite a unique smell. That said, I would sub orange flower water and simple syrup in a 1:3 ratio. However, if you don’t have that handy (Amazon by the way would have this), then yes, try St. Germain. It will still give off a floral scent and add sweetness, just different than the Pavan. For the ginger shrub sub, making a strong ginger syrup would also work. The Shrub and Co. Ginger shrub is a super strong ginger taste, so keep that in mind when making a syrup. When you taste the syrup, you want it to almost be “too” gingery since it will disperse quite a bit in the rest of the drink. You will lose the tartness of the shrub but not using one, but I don’t think it will be drastically different. Please come back and let me know how it worked for you!